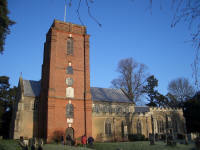 What do you get if you have 13 young people; a rural village; a tower with 8 lovely bells; and a hot, beautiful summer’s day? 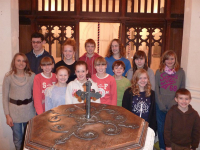 You get a fun afternoon filled with great ringing for all ages! 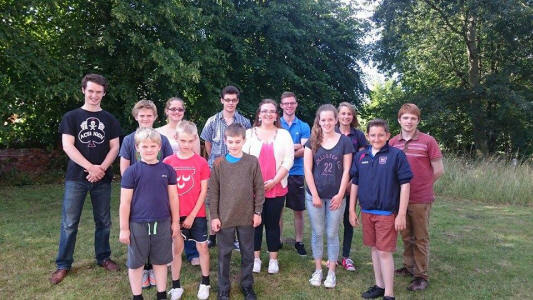 On 5th July, young ringers from each district, came together in Ufford and rang many methods ranging from Rounds on 8 for those that had just started to ring, to Ipswich and Cambridge Surprise Minor Spliced, as well as Lincolnshire Surprise Major for the more experienced ringers. It was a perfect way to spend a balmy Sunday afternoon, and to get some much-needed experience for the newer ringers. Everyone present did an astounding job and seemed to go away feeling pleased with themselves and what they had rung. Thank you to all those involved in organising the practice and those that drove the youngsters attended! The practice started with a good raise of the back 6 and the two trebles separately. We then set to work with a good attitude to do plenty of ringing as this had just followed our young ringers meeting. We started with a piece of call changes on the 8 and they were rung quite well. 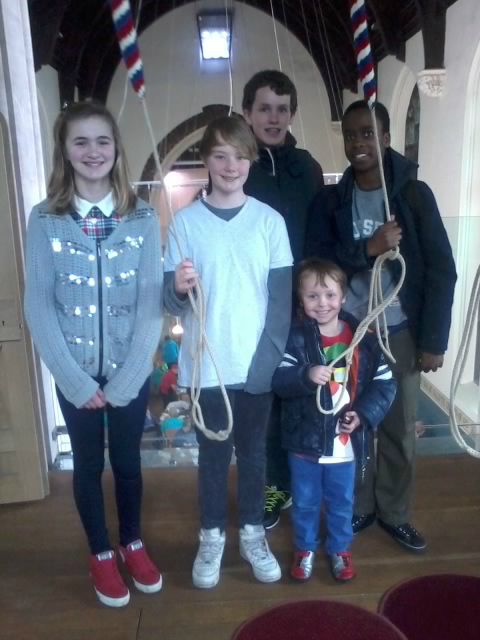 The band included some of our youngest change ringers on board also with Richard Stevens (age 11) and Carmen Wright (age 11). After the called changes we then rang a various amount of things on 8 including plenty of plain hunt on 7, with some people ringing this for the first time and also a little more call changes. As far as more methods went we rang Ipswich S Minor for Simon Veal and also Cambridge S Minor for Richard Stevens. We rang some spliced doubles and also some Stedman triples for some of our older young ringers. All in all I believe that it was a good practice with a good outcome and I am very much looking forward to the next. 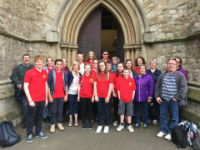 Torrential rain and unseasonal temperatures didn't put Suffolk's young ringers off a half term trip to Felixstowe on Tuesday 27 May. The beach may have been uninviting, but the ringing room at St John the Baptist church was cosy and warm and welcomed a small group who enjoyed ringing these lovely bells. While the focus is now firmly on the imminent National Youth Competition in Worcester, it didn't stop the group welcoming a new member, Adam Shard from Bury St Edmunds and also helping and encouraging its younger members like Richard Stevens from Sweffling, who at 10 is probably the youngest member. The next event is a trip to London organised by George Salter, which should prove to be a fantastic day out. Please contact for more information. All young ringers are welcome. 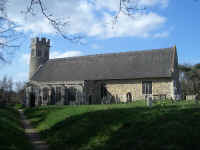 The ever growing group of Suffolk Young Ringers descended upon Bardwell church on a glorious spring day just before Easter for more fun on the popular Vestey ring, tower bell ringing using the simulator, handbells and a challenging Easter egg hunt. A lot of activities were crammed into the few hours between and 11am and 3pm, including a vital opportunity for the team which will be representing the Suffolk Guild at the Ringing World National Youth Contest at Worcester on 5 July to practise ringing together. It didn't take long for even the newest ringers to be double handling on the mini ring and we are very grateful to Brian Whiting for bringing this along and cheerfully helping out during the day, even staying chilled when a crucial bolt got stuck during the dismantling process. Everyone brought a picnic which was eaten in the bright and warm sunshine, and this was followed by a Bellringing themed Easter egg hunt. Cards with numbers were cunningly hidden in and around the church and churchyard, and once a full set had been found, the teams then had to arrange the numbers into Queens in order to qualify for their prize of Easter eggs. Thanks to Katharine for dreaming that one up! The meet also gave us all the opportunity to develop plans for the much anticipated trip to Worcester for the competition. Accommodation has been booked at the University of Worcester and Michelle Williams has done a fantastic job of securing an impressive amount of sponsorship funding. Thanks too, to all the wonderful helpers who turned up on the day for their encouragement and support. Lots of practice quarter peals are being planned for the coming weeks, and more practices at half term. 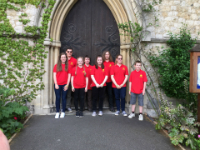 A small group of young ringers from St Mary's Kilburn in London travelled to Ipswich by train to meet up with some of the Suffolk young ringers for a day of ringing and exploring. 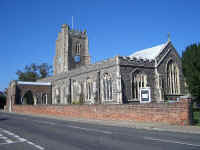 The day began with a visit to the fine old town centre church of St Lawrence with its impressive tower to ring the historic "Wolsey" bells, the significance of which was not lost on the group, who had been asked to name important historical events that the bells might have rung out for over the centuries. This was followed by a walk through the bustling town centre, with its market stalls and calling traders, to the quiet setting of St Matthew's for some first practice at Plain Hunting, ably and enthusiastically instructed by Ruth Suggett. 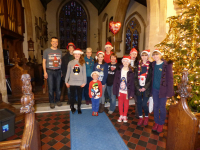 The final tower was the mini-ring at The Wolery, where, after what seemed like an epic trek the group were warmly welcomed into the Salters' family home and enjoyed their first experience of ringing on mini bells. The day was rounded off with a meal in Ipswich before heading back to the big smoke. Our thanks go to Ruth Suggett and George and Katharine Salter and family for arranging the day. This is the first of a number of meet ups being planned this year, the aim of which is to bring young ringers together from across the country to share in the enjoyment of ringing and make new friends. A similar meet up is being planned in London for 6th April, and in Worcester for the National Youth Striking Competition in July. Details to follow. Young ringers from all over the county met on Monday for some half term ringing! First of all at Clopton - a grab for most of us as they have only recently been restored. A lovely ring of bells for the young ringers to handle. Then it was on to Grundisburgh, always a popular tower with the young ringers. Maggie kept everyone ringing and made sure everybody challenged themselves by ringing lots of different bells and methods as well as call changes. Ringing was temporarily suspended while Michelle's delicious cupcakes were consumed, all too quickly, unfortunately. 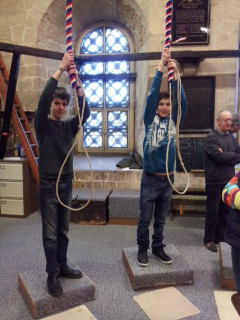 Well done to everyone who came especially those who had their first taste of twelve bell ringing. Thanks to Joanna for unlocking and helping at Grundisburgh. Next YR event... Saturday 29 March at Theberton and Aldeburgh! Keep checking What's On for more information. Harry on the left and Peter Barron of Mildenhall at the NW District Practice at The Norman Tower. Otley is an easy going ground floor ring of six made up of some quite interesting bells including four pre reformation examples dating from 1500. 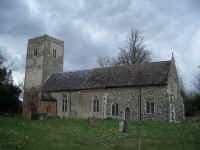 Some 513 years later, on a dark and rainy evening this parish church was the setting for the November meeting for the merry band that had come to be known as Suffolk Young Ringers. There were new faces including a few Otley ringers back from university and some stalwarts of The Guild fresh from a peal at Grundisburgh. The peal was commemorating 300 years since Fabian Stedman's death. Perhaps in 300 years time peals will be rung for a SGR ringer of 2013? Something to aspire to! 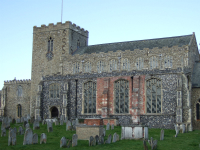 The nights ringing included Rounds, St Clements, Norwich, and a touch of spliced doubles in preparation for the Young Ringers peal that was duly scored on the following Thursday at the Wolery and believed to be the youngest band to ring a mini bell peal which you can see on bell board. Hopefully more records, footnotes, and indeed quarters & peals to come from Suffolk's young ringers. The ringing at Otley was of a generally high standard with emphasis on the quality of striking. while at the same time challenging our skill set with more advanced elements of 'the exercise'. This calibre of practice is key for developing the new ringers of Suffolk as learners will not be retained unless they have a structured scheme of progression that creates a sense of inertia about learning new things. Everyone, please challenge yourself, and the people you ring with, to do something new. Nothing bad will happen if someone doesn't get it right the first time but nothing will happen at all if we don't have a go at something new! Constant review of progress is what's needed otherwise we'll end up with swathes of Suffolk towers ringing out with the sound of just bad call changes, mediocre plain bob doubles, and nothing else. It was really encouraging to see around 25 people turn out at Otley as a year ago we would of got less than half the number and this was just an ordinary practice. Thanks again to everyone who came along! Our next event is the February half term practice at Grundisburgh on Monday 17th Feb. Please do come and join us to try something new! Welcome to the first young ringers blog post which will hopefully be the first of many. 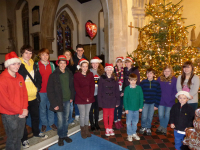 Here we shall be keeping you all up to date with all that young ringers are doing in the county and beyond. 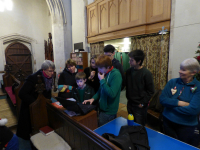 On Thursday of half term 16 young ringers plus some slightly older ringers were involved in a Halloween ringing extravaganza. The fun started at the complete Thomas Mears Eight housed in the fine perpendicular church at Helmingham where the members of the York band gathered for a ultimately failing quarter peal attempt which I am sure would have been duly scored at the second attempt if not for our commitment to get to our next tower. Though we did ring some nice spliced doubles and a cracking ringing down in peal on the 17cwt eight which you can view on YouTube. 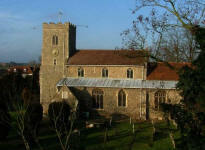 The next tower in question was Winston, a rather rural light five, situated in a village of only 100 souls. Here we were joined by the other youths and we rang a mixture from rounds for the people who were taking their first steps in the noble art up to to the chosen method of the day, All Hallows Place Doubles. 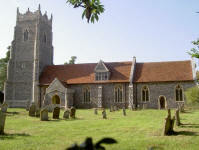 After this characterful tower it was then on to Debenham, a tower steeped in Suffolk's ringing history. So how appropriate it was that we were met by Radio Suffolk's Rob Dunger who then proceeded to discuss the merits of change ringing and young people with myself and Ambrin. He's very keen to keep in contact with what we're doing in the county so you'll hopefully be hearing more of our dulcet tones on the airwaves. Thank you to Michelle for organising the coverage. It could turn out the be highly lucrative, especially when it comes to RWNYC 2014. The ringing at Debenham was of a high standard, with a great range of ringing from those who had their first chance at ringing on 8 upto a lovely course of Stedman Triples and Bristol Major. Everyone should be proud of what they rang. Now it was time for some fun and games in Dove Cottage. First though some food was in order. 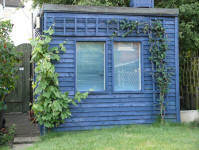 All prepared, in a Halloween style, by the self proclaimed four witches of Suffolk. And I can confirm it was all very tasty and consumed with great gusto by all. Then onto the games which included a trick and treat version of parcel the parcel which comprised of impressions of 'famous' Suffolk ringers and an incident with a box of flour. I'll leave you to imagine what was involved! Many thanks to all those who came along please do keep supporting these events in any way you can whether that be informing your young ringers of these events, or accompanying them when the come along. They really do make a difference as they give an opportunity to ring something more advance and mix with fellow ringers which is a great factor in retaining these ringers. So if you know of any young ringers that don't currently attend our events do get in contact with us. Though it was great to see some new faces on Thursday. Thank you to the dedicated but small team that make these events possible and long may of as high calibre this excellent meeting. Remember to please come along and support our next event which is on 30th December 2:30pm-4pm at Sproughton. Where will shall be running a Christmassy practice. The future is bright if we maintain this enthusiasm for the young ringers of Suffolk. And I'll leave you with this quote from Ralph Emerson "Enthusiasm is the mother of effort, and without it nothing great was ever achieved." Food for thought!